Tragedy. Theme. Crisis. Climax. These are the elements that are used to create award-winning screenplays. In Scriptologist.com's step-by-step plot structure exercise, you will learn how to master these storytelling elements. How to give your screenplay a dramatic beginning, middle, and end. story toward a mind-blowing climax. 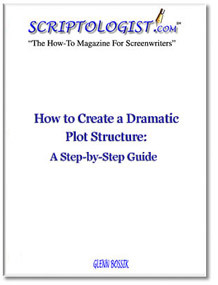 How To Create A Dramatic Plot Structure: A Step-by-Step Guide. The full exercise is only $5 and you will get instant access to it as a downloadable Adobe PDF file. Scriptologist.com's secure credit card processing service, PayPal, accepts customer orders via Visa, MasterCard, Discover, American Express, and debit cards with the Visa and MasterCard logo.